The final chapter of the Albion Hotel's band competition, Showdown was last Sunday with the youthful Extortion taking the honours. Out of 26 bands competing throughout the heats, the grand final was broken down to Extortion, Durisdeer, Sleight Of Hand, Scar Child, Headsmack and Myx. Roslyn Tawk of Millennium Business Management, who put on the competition for some of Newcastle's top original bands, said all six bands were fabulous, giving great performances. 'The competition was extremely intense and the judges found it difficult when deliberating,' she said. The turnout for the final was indicative of how popular the competition has been. 'At 3pm things looked a little bleak, but by 4pm you could not make your way through the crowd,' Ms Tawk said. 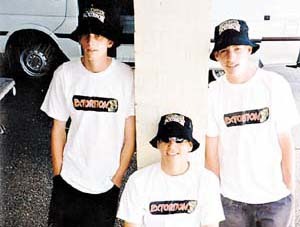 Ms Tawk said Extortion displayed professionalism and talent well beyond their years and improved with every performance. The band is made up of Nick Cook, Morgan Evans and Tom Evans. This tight unit has been popping up regularly at pubs in Newcastle. The laid back and versatile stylings of Myx won second place with the female-fronted Durisdeer in third. Sleight Of Hand, Scar Child and Headsmack were in no way disgraced and have loyal followers when they perform at venues such as The Cambridge.